I find it very interesting to see how many would-be typewriter inventors across America concentrated on index and typewheel designs in the 10-15 years after the Sholes & Glidden became a reality in the marketplace. Could it have been because of patent rights on the typebar and keyboard arrangement? Or possibly because the typebars and keyboards were coming from left field, that typewheels and even an index were considered more conventional back then. 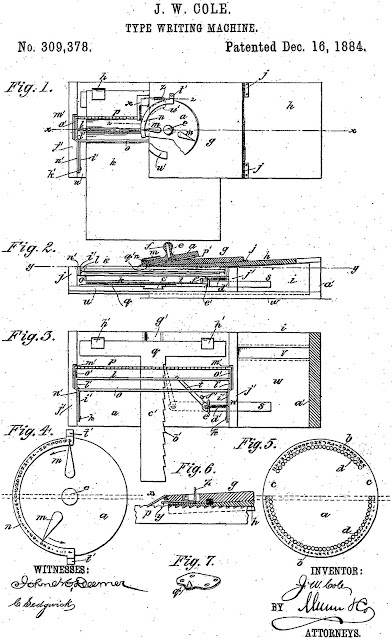 Given Pratt had used a typewheel (and keyboard) in the mid-1860s, and Crandall and Hammond were so keen to follow suit, typewheels would appear to have been more mainstream in this 1870s-1880s period than they became after the Sholes-Remington patents expired (mid to late 80s). Let's face, it was the Sholes patents that Yost wanted to use when he set out to make the Caligraph. Then came the Hall index (with typewheel), the Crandall and the Hammond (typesleeve, typeshuttle). 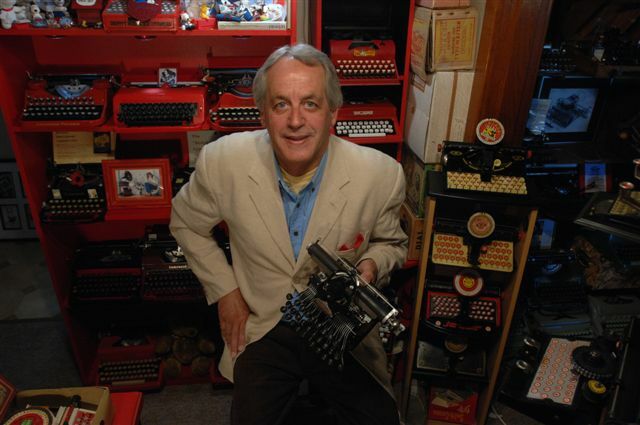 Maybe it was simply a perceived need to make much smaller, lighter and simpler typewriters. Whatever, on this day (December 16) in 1884, telegraph operator James Warren Cole, of Spearville, Kansas, patented his version of a typewheel typewriter (above), which Michael Adler in Antique Typewriters described as "a primitive circular index machine". At least Cole produced a model with his patent application! Cole was born in Erie, Pennsylvania, in 1852, and died on August 26, 1913. His son Warren became a Remington salesman in Kansas.